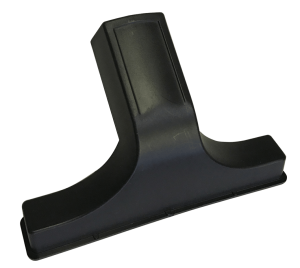 The X-Stream™ Hand Vac is the low-cost solution to a variety of industrial housekeeping applications. 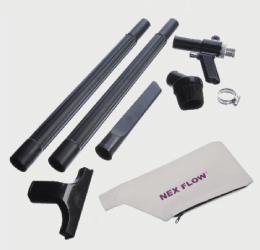 It is a blow gun, a vacuum gun, a collection system, and a transfer system in one simple package. 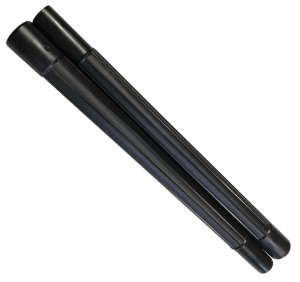 It is lightweight die-cast aluminum and uses less air than a normal blow gun. It draws a vacuum at one end to produce a high vacuum for collection or transfer of materials. 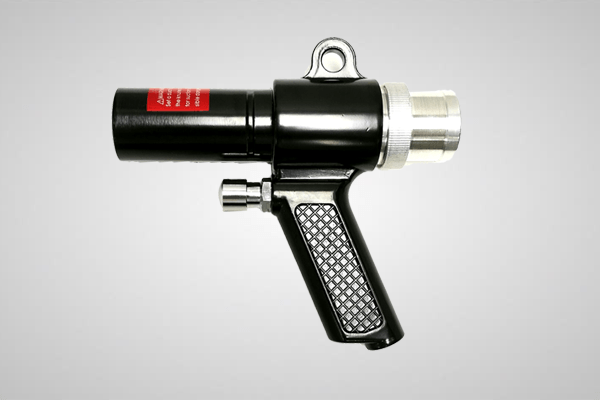 It is easily converted from a blow gun into a vacuum gun and back again. . 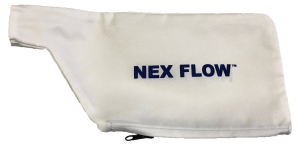 In vacuum mode, it can be used to vacuum up debris, and debris can be collected in an available reusable vacuum bag. The amplified air flow in the X-Stream™ Hand Vac is approximately 12 times the compressed air consumption. This gives it a high vacuum when in vacuum mode and high blow off force in blow off mode. 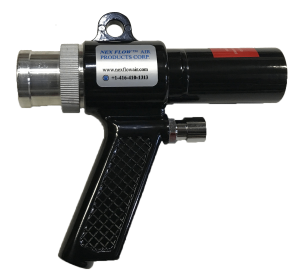 In blow off mode, the 1-1/4”(32 mm) diameter outlet allows it to cover a much greater area than a small blow gun for faster cleaning and drying. In vacuum mode it can transfer material over long distances using a vacuum hose which is supplied in the transfer kit and the all purpose kit. 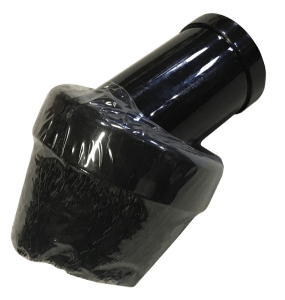 Also in vacuum mode, it can be used to pick up debris that can be collected in the reusable vacuum collection bag that is supplied with the collection kit and the all purpose kit. In fact, it is actually against the law to clean clothing for example with compressed air in many jurisdictions. The Hand Vac in vacuum mode can do this cleaning with safety in mind. The unit can be switched from bow off mode to vacuum mode and back again in under a minute. It is lightweight and portable with no moving parts. Essentially maintenance free, safe to use, and durable for long life its ergonometric design makes it comfortable to use. Some applications include the cleaning of machinery and controls, inside control panels, vacuum sawdust, sold spills, shavings and waste and to transfer small parts, trim and other solid materials. The Hand Vac uses only 13 SCFM (368 SLPM) at 80 PSI (5.5 BAR) to produce a vacuum of 29.5 inches of water (-7 kPa) and produces a force of 9 ounces (255 grams). 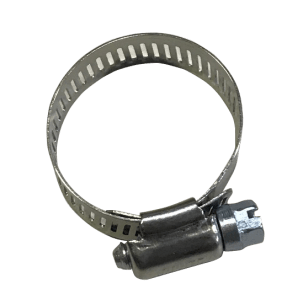 Compressed air inlet connection is ¼” NPT. It is always recommended to use clean, filtered compressed air with the unit. Both a water removal filter with auto drain and an oil removal filter with auto drain can be supplied as options. 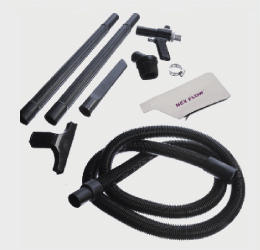 Model 36011 – Collection System consists of X-Stream™ Hand Vac plus reusable collection bag, cleaning brush, crevice tool, skimmer tool two extension wands and stainless steel hose clamp. 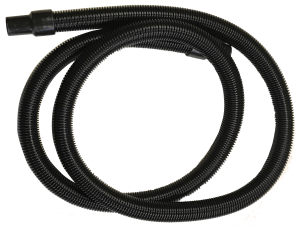 Model 36012 – Transfer System consists of X-Stream™ Hand Vac plus 10 foot (3m) vacuum hose with cuffs at both ends, cleaning brush, crevice tool, skimmer tool, two extension wands, and stainless steel hose clamp. 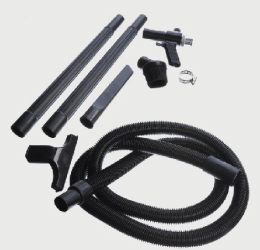 Model 36013 – All Purpose System consists of X-Stream™ Hand Vac plus 10 foot (3m) vacuum hose with cuffs at both ends, reusable collection bag, cleaning brush, crevice tool, skimmer tool, two extension wands, and stainless steel hose clamp. Compressed air enters at point (A) and is allowed to flow into the Hand Vac using the trigger at point (B). Air either exits at point (C) for blow off or point (C) is a vacuum depending on the setup of the generator inside the Hand Vac. Similarly, at point (D), air either enters (in blow-off mode) or exits (vacuum mode). The generator inside can be reversed to change the mode from blow off to vacuum and back again as required.